Out with the country set…. When we left the Outdoor show we made our way to a small village just off the A14 called Hamerton. I thought I lived in the middle of nowhere but this is even more remote. 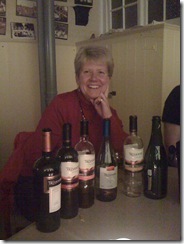 We had been invited by friends to the local wine tasting evening, to be held in the village hall. Louise did the talk and presentation of 6 wines all from Argentina. First it was a Cava then 2 white, a rose and 2 red, one of them being oak smoked. 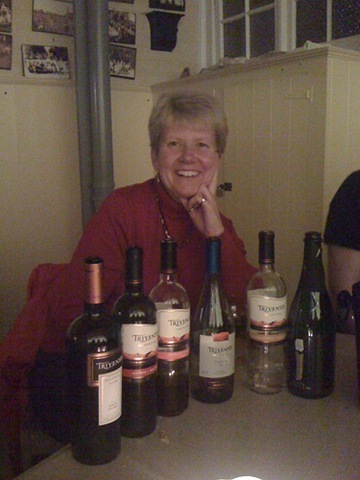 I am not really much of a drinker, but all wines were very pleasant, Geoff particularly enjoyed the oak smoked red. A great evening w as had by all. The following day we had plans to meet up with more friends at Grafham Water and cycle round it on a tandem, but much to my disappointment the weather had turned bad so this had to be cancelled. 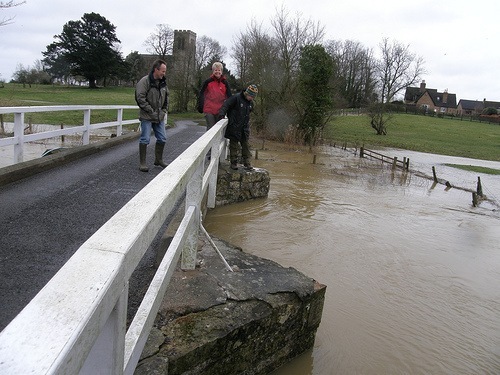 Instead we had a guided walk around Hamerton and saw to our amazement how much flooding can be caused by one and a half inches of rain. 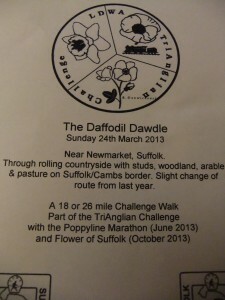 Walk route can be seen here….. This entry was posted in Events on March 17, 2008 by Sally. 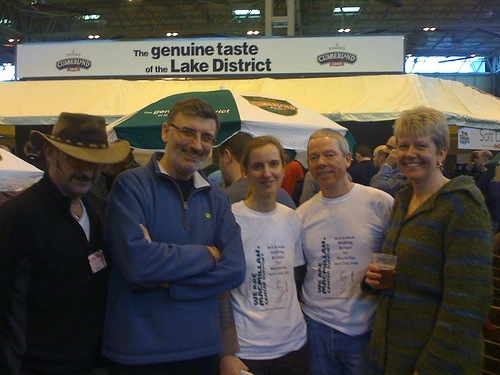 Great day yesterday down at the NEC in Birmingham for the outdoor show. Although we were disappointed with the lack of outdoor stuff on sale. Geoff was hoping to see some light weight cooking stuff and I was after a new hydration system but we found none of these. 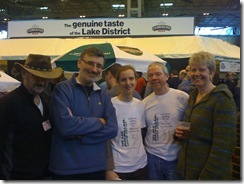 For us,what made the day was getting to meet up with some of the Outdoor Blogger’s and finally put names to faces. They wanted to know all about twitter so Geoff explained it well and we may have some new followers soon. 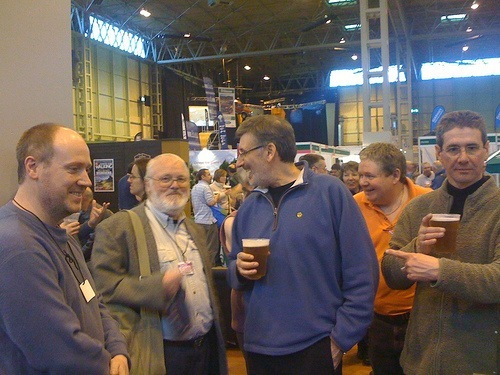 Great to also meet Daren,Duncan,Johnhee, Alan Sloman, Phil Doodlecat,Andy Howel , George and anyone else I may have forgotten. Four of them even got to sample one of my muffins too. This entry was posted in Events on March 16, 2008 by Sally. 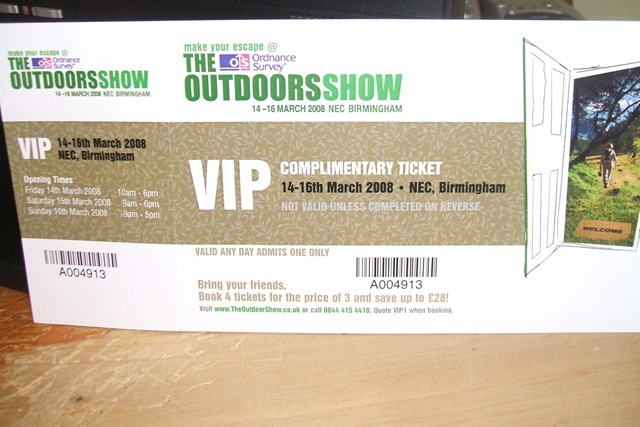 The Outdoors show.. NEC Birmingham. Thanks to complimentary free VIP tickets from Paramo. 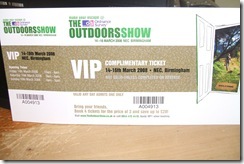 Geoff and I will be going to the outdoors show on Saturday the 15th March. This entry was posted in Events on March 12, 2008 by Sally. Today after a great lunch at CRUFC we watched Cambridge play Rotherham. Rotherham are in the leauge above Cambridge so we were unsure what the outcome would be, but Cambridge played an excellent game and lost by only one point. 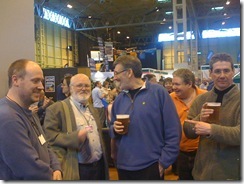 Many Thanks to Philip for inviting us to the rugby once again and Doug and Adrian for being such good company too. A great afternoon enjoyed by all. This entry was posted in Events on January 12, 2008 by Sally. Well as I needed to know what to pack I just had to ask Geoff about my Mystery holiday…. I now know we fly from Luton on Monday at 6am… and will be away a full week. I think we are going to 2 places one warm one maybe cold….. Pack walking stuff, walking sandals, maybe boots, jeans, and posh girlie skirt and shoes…. Now the wicked bit only hand luggage so I have to pack very light…. I thought about all my toiletries and nice perfume…. Geoff said don’t pack any buy it when we get there…. Packing always stresses me as I never know what to pack….none of my clothes match… Girlie skirt with walking jacket !!!!! Everyone is so desperate to find out where I am going… that’s people from work… friends, my boys, my mum and Dad, and people from massage course too. So I have told them all to read my blog on Monday….. Tomorrow I will be unbearable at work, then home, pack and off to Cambridge…and another adventure begins. I have never had a surprise like this before… it feels Fantastic and it goes with out saying that I am bursting with excitement. This entry was posted in Events, Personal on September 27, 2007 by Sally. As far as I know we go away 2 weeks today, only a few days after Geoff gets home from the Pyrenees. I dropped it into our conversation last night when he rang me…. all I got was pack light no more than 10kg ,wear walking kit and its high so could be cold….. I have tried to get some information from Emily but she is not playing in fact this is what she had to say…. Don’t know about you but I am going to burst with excitement soon…. not only am I excited about Geoff coming home but what a surprise I have to look forward to as well…. Any one like to take a guess at where I will be going and what I will be doing ??? This entry was posted in Events, Personal on September 17, 2007 by Sally. After a very emotional and draining Funeral in Romiley near Manchester. My boys were fantastic , Matthew even managed to get up and say a little speech all about his dad, Andrew dealt with it in his own way but they are boys to be proud off. For me it was a very hard, emotional day but I think I dealt with it well and would like to say Thank you to all those people that showed me and my boys great kindness in our time of sadness. I now have a lot to deal with over the coming weeks/months and I hope I can deal with it quickly and painlessly, although I doubt it will be painless for me. A big Thank you must go to Geoff who drove us up to Manchester and collected us after the funeral, it was a big help, we loved the tour round Creswell his home town, and the Boys enjoyed staying in Cambridge ,was like a little holiday for them. I spent the rest of the week-end swimming and sunbathing, recharging my batteries ready for the coming weeks. I see James has been blogging about the lack of visitors from blogpower people so I really must try and get round to visiting them all some time this week. I also see lady M has awarded me the Thoughtful Blogger Award, which is most kind of her. I will pass it onto Ellee, Anne, and of course Geoff…. This entry was posted in Events, Personal on August 6, 2007 by Sally.